Better Buy: Royal Gold, Inc. vs. Goldcorp Inc.
With Goldcorp stock hugely lagging Royal Gold in 2016, is now the time to buy? Gold stocks had an incredible run in 2016, with most stocks ending the year with double- or even triple-digit percentage gains. Investors in Goldcorp Inc. (NYSE:GG), however, might have felt left out -- even with its 18% gains, Goldcorp was one of the worst performers among the large publicly traded gold stocks. Forget miners, even gold streaming stock Royal Gold, Inc. (NASDAQ:RGLD) ended the year with a staggering 74% gain. So why did Goldcorp underperform peers? Did investors overlook the growth potential in Goldcorp and might want to consider buying the stock now, or is Royal Gold still a better bet? Given the unpredictable nature of gold prices, a miner's strength today greatly lies in its ability to control costs. While Goldcorp is restructuring its operations like most miners, the results fail to impress at a time when a rival like Barrick Gold Corporation (NYSE:GOLD) is making a dramatic comeback. To put that in perspective, Barrick upgraded its full-year production guidance and lowered its all-in-sustaining cost (AISC) projections to $740-$775 per ounce of gold in its last quarter even as Goldcorp stuck to its earlier production and AISC estimates of $850-$925 per ounce. Those numbers place Barrick at the lowest end of the industry cost curve but Goldcorp at the higher end. Worse yet, the 17% decline In Goldcorp's production during the nine months through September 2016 was also bigger than Barrick's 11% decline. Not surprisingly, investors became wary of Goldcorp's prospects and flocked to stronger players like Barrick and Royal Gold instead. Royal Gold, in fact, smashed it in 2016 with its revenue and earnings per share even hitting record highs in its fiscal first quarter ended Sept. 30, 2016. As a streaming company that doesn't own mines but buys precious metals from miners in return for funding them, Royal Gold doesn't have to worry about exploration costs unlike Goldcorp. More importantly, Royal Gold secures bullion from miners at prices substantially below spot rates. 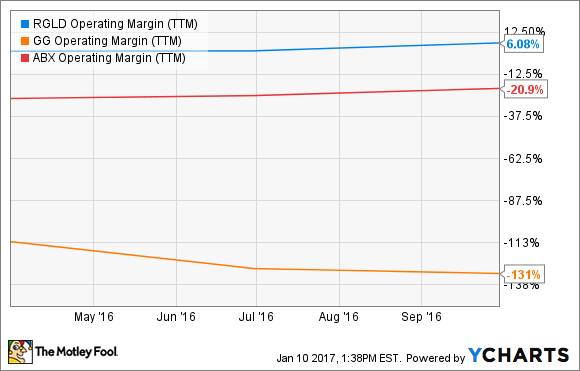 You can only understand what a huge advantage that is when you check the margin comparison chart below. RGLD operating margin (TTM) data by YCharts. So, Royal Gold's margins stayed in the positive territory despite gold giving up much of its first-half gains as 2016 progressed. That almost makes Royal Gold a no-brainer choice when compared to Goldcorp, isn't it? All eyes are on Goldcorp's upcoming full-year earnings release and investor day, wherein the company is expected to announce encouraging multiyear cost reduction and growth plans. The miner is presently working on a $250 million cost-reduction program that it outlined last year and expects to achieve by 2018. Goldcorp is adopting a twofold strategy of divesting non-core assets while improving productivity at primary mines like Penasquito. The miner is reportedly planning to sell several small mines such as Camino Rojo in Mexico and use the proceeds primarily to deleverage. As of Sept. 30, 2016, Goldcorp held $2.5 billion in long-term debt versus cash and cash equivalents worth only about $340 million. That's a big debt load, but remember, Barrick's remarkable turnaround in 2016 can largely be attributed to its aggressive divestments to clean up its balance sheet -- something that Goldcorp management has also set out to achieve. On that front, I believe 2017 could be an important year for Goldcorp as it streamlines operations to boost its financials, and that should reflect in its stock price. Royal Gold is, undoubtedly, a superior company in terms of operating performance and shareholder returns thanks to its streaming business. While Goldcorp started paying out a dividend only in 2015 and has already slashed it twice since, Royal Gold holds an enviable track record of 16 straight years of dividend increases. That said, Goldcorp might have a stronger run this year for reasons mentioned above and its relatively muted performance versus peers in the past year. So, in the near term, Goldcorp's potential turnaround story could be rewarding for investors. But if you're wary of the volatility in gold prices and prefer to have a cushion of safety, Royal Gold remains one of the best gold stocks to invest in for the long haul.